Measuring sea height was traditionally done by sailors at sea watching the waves. 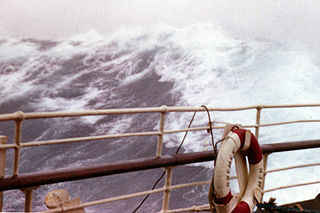 The heights of all waves for a time frame would be recorded, and the average of the highest one-third of the waves would be recorded as the significant sea height. For a simple example, if wave heights of 1, 2, 3, 4, 5, and 6 feet were measured, the significant wave height would be 5.5 feet: 5 and 6 are the highest one-third of the waves and they average to 5.5. For a real-life example see the wave histogram from CDIP– it shows a distribution of the current wave heights, and tells you the highest one-tenth of the waves (rather than one-third). The highest individual wave will be about twice the height of the significant wave height. Buoys and wave forecasts calculate the significant wave height a little differently. They add up the energy from all the different wave periods in the wave spectrum and get a height similar to the highest one-third of the waves. This Sea Height is always higher than the individual swell heights because waves of different periods and directions pile on top of each other, or crash into each other from different directions. Sea height can be useful to surfers as a single, simplified measure of wave height. On Swell Matrix it is there on the top row so you can take a quick look at what the waves will be doing, but figuring the actual surf height is more dependent on individual swell heights. You may notice that the Sea Height is highest relative to swell height when there is a north/south combo swell or wind swell mixing in with ground swell.